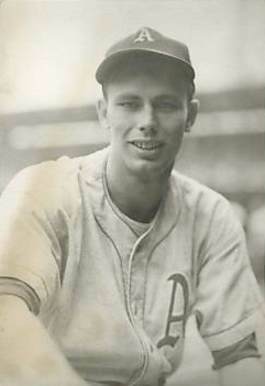 Charlie “Bubba” Harris Jr., 86, former pitcher for the Philadelphia Athletics and Cleveland Indians, passed away January 12, 2013 in Nobleton, Florida. Harris was signed by the Pittsburgh Pirates out of Jones Valley High School in Birmingham, Ala., prior to the 1943 season. He spent two seasons in their minor league organization before his entry in to the United States Navy in 1945 during World War II. He served in the Pacific Theater for a year before returning to baseball in 1946. His path to the majors was accelerated after being acquired by the Athletics in 1947. After one season in their minor league system, Harris made the major league club in 1948. He posted a 5-2 record and led the team in appearances with 45. In May, 2011, I was contacted a relative of Harris’ regarding his inclusion in the deal by the MLBPAA to grant non-vested players from 1947-1979 with annuity payments. His relative put me in touch with “Bubba” and his wife Doris, to help them receive the benefits they were due. During that process, I spent a few minutes talking with Harris about his time playing under the guidance of the legendary Connie Mack. “He was the grand old man of baseball. He deserved everything that he had. … I enjoyed playing with him,” he said. Mack, impressed by Harris’ performance, brought him back in 1949. Harris, once again was the featured man out of the bullpen, leading the team in relief appearances with 37. He then spent the 1950 season at AAA, and returned to the majors in 1951 briefly with the Athletics before being traded to the Indians a month in to the season. Even though Harris only lasted 10 days in Cleveland before being sent to the minors (due to the May 16th deadline of teams only being able to carry a 25-man roster), his memories of that legendary pitching staff remained fresh in his mind 60 years later. Harris continued to pitch in the minors through 1956, mostly at the AAA level with the Havana Sugar Kings. After baseball, he worked as the commissioner of the Florida Unemployment Appeals Commission. Playing in what many call the golden era of baseball, Harris was grateful to have the opportunity to share the field with so many stars.